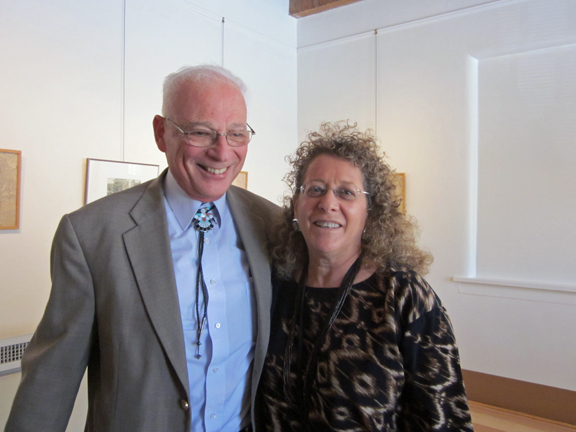 Noel Pugach, a professor emeritus of history at the University of New Mexico, delivered this week’s Centennial Brainpower & Brownbags Lecture in which he explored the story of the man who managed to give New Mexico what it had sought for more than 60 years: statehood. But beyond making New Mexico (and Arizona) a state, President William Howard Taft left a legacy that can best be represented by a shrug of the shoulders. “Taft had a distinguished career before and after his presidency, yet most historians rate him as an average president–even mediocre,” Pugach said. When Taft took office, some conservative Republicans remained stuck on the idea that a New Mexico-Arizona combo state was the only way to go, despite Teddy’s best efforts to dampen their zeal. 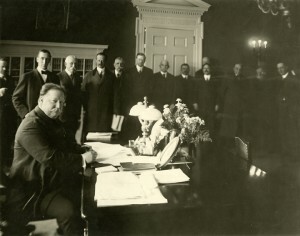 Taft did some of his own cajoling and negotiating to quell that plan, then had to engage in some last-minute horse-trading that weakened his ideas for regulating the railways in return for granting New Mexico statehood. The Cincinnati native had graduated from Yale where he not only scored good grades but had enough social acumen to win an invitation into the secret Skull & Bones Society. He earned a law degree and embarked on a political career of appointed positions–an important distinction, Pugach said, given Taft’s later inability to succeed at the mano a mano of electoral politics. After he served admirably as chief civil administrator in the Philippines, Roosevelt made him his Secretary of War (despite a lack of military experience) and, though he dreamed of being a Supreme Court justice, Teddy and Taft’s wife, Helen, pressured him to run for the presidency against Democrat William Jennings Bryan. He won handily and eventually amassed a record as a better trust-buster than Roosevelt (though Teddy would get the glory). He didn’t like Washington and spent so much time traveling that he got a reputation of being out of touch. By 1912, when Republicans nominated Taft for a second term, Roosevelt had lost so much faith in him that he formed the “Bull Moose” Progressive Party, thereby splitting the GOP vote and handing victory to Wilson. Taft went happily back to Yale, where he served as a law professor until President Harding gave him his dream job, Chief Justice of the United States. The legwork is underway to create a 2013 exhibit about one of New Mexico’s favorite subjects: Cowboys. 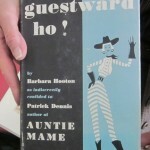 (And, yes, cowgirls.) Guest curators Louise Stiver and Byron Price are sifting through a wealth of material to decide which aspects of cowboy life will be highlighted and how we’ll tell those stories. In the museum’s collections vault, we already have an array of cowboy-related materials, and the Palace of the Governors Photo Archives could make the Marlboro Man weep with the amount of historical photography it holds on ranch life. Even so, we couldn’t say no to the offer of a clutch of cowboy-related materials from John Egan and the Egan family, who operated Rancho Encantado in Tesuque from 1967 through 1995. Betty Egan, a Cleveland woman who loved Western novels, had a yearning to live in the wide open spaces, and Slim Green told her about Rancho del Monte, a dude ranch owned by Bill and Barbara Hooton. 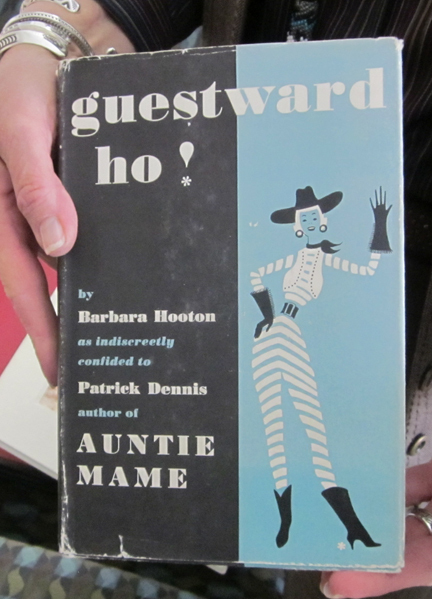 Trivia keepers will want to know this about Rancho del Monte: Barbara Hooton collaborated with Patrick Dennis, the author of Auntie Mame, to create a 1956 novel of city slickers running a dude ranch, which became (briefly) the TV sitcom Guestward Ho! The items included in the Egan family’s generous donation have yet to go through our accessioning process, which includes being voted on by the Museums of New Mexico Board of Regents, but we couldn’t resist sharing a glimpse of them with you. 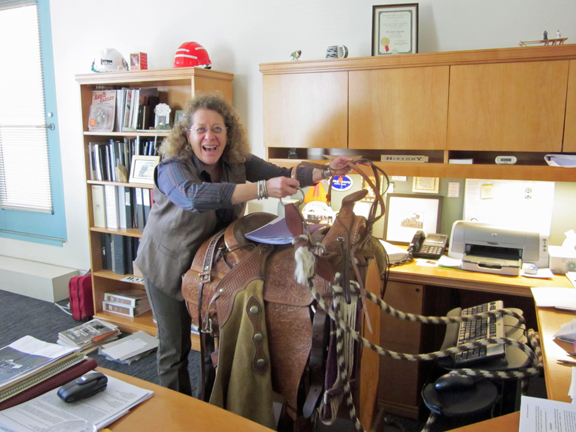 In fact, some of the wise-guys in our office couldn’t resist setting up an exquisite Slim Green saddle as the new desk chair for our director, Frances Levine (at left). 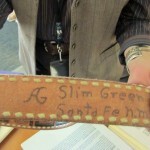 Slim Green is a story unto himself: Born in 1916 in Oklahoma and soon relocated by his family to Texas in a covered wagon, he showed cowboy know-how from a young age, quickly learning the difference between a good saddle and a bad one. He couldn’t afford the former, so apprenticed himself to Pop Bettis, a renowned saddlemaker in Lubbock. As his skills advanced, his saddles became hand-tooled works of art that fit every rider’s particular needs. 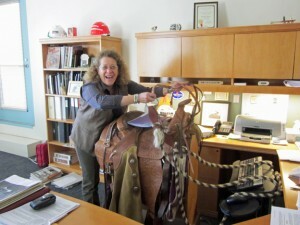 Cowboys, movie stars and governors have chosen Green’s saddles, and he’s considered a master traditional artist by numerous arts organizations. 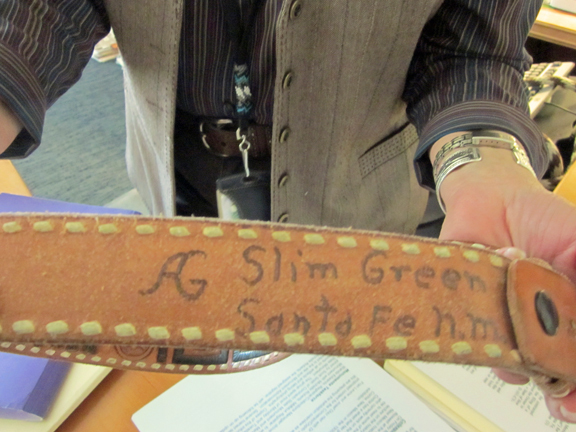 Among the other items partially filling up Levine’s office: a Slim Green belt made for John Egan (Betty’s son, and the ranch’s general manager for 18 years); a pair of chaps; spurs; bridles; business ads; two bottles of Rancho Encantado wine; two cattle brands owned by Betty Egan; and photographs from the ranch’s heyday, when it attracted the likes of Robert Redford, Kirk Douglas, Johnny Cash, June Carter, Whoopi Goldberg, Jason Robards, and Frank Capra. Besides running the Rancho Encantado, Betty Egan financed the construction of the Tesuque Fire Department and was the first female fire chief in the nation. Rancho Encantado today is the Encantado resort. As we work on this early stage of the exhibit, set to open in February 2013, we’ve been gratified by the generosity of people like the Egans and the enthusiasm of so many people to share their stories. We promise this: A root-tootin’ good time will be had by all.